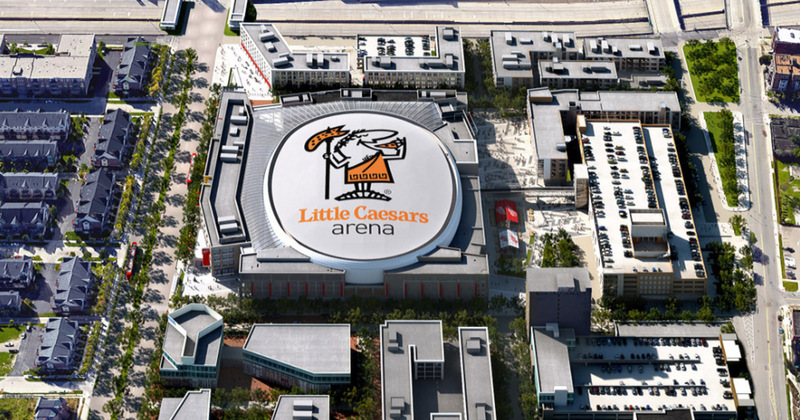 A rendering of Little Caesar's arena. The Detroit Pistons today are scheduled to announce that they will be returning to Detroit from their home in Auburn Hills. They will share space in the new Red Wings stadium but are looking to build a practice facility. The local Downtown Development Authority is involved in the transaction somehow, but details about its specific contribution are unclear. Like any DDA, the Detroit authority can provide taxpayer incentives and other assistance to private business operations. The new Red Wings stadium — which is still under construction — was dubbed a “catalyst” development by Lansing lawmakers in 2012 when they granted financial favors to the hockey team’s owner. The idea behind a “catalyst” development is that it is a big enough and powerful enough project to inspire more development. But a study published in the Journal of Sports Economics, titled “Do New Sports Facilities Attract New Businesses?,” finds that new sports facilities are not business catalysts. This study is an important new contribution to the research on how professional sports affect the economies of major cities. It suggests that Michigan laws (passed or proposed) to promote “catalyst” or “transformational” projects that involve sports teams have no impact on the creation of new businesses. They also have little, if any, impact on employment. This study is yet another in a long line of academic research that demonstrates the ineffectiveness of professional sports stadiums (or teams) — subsidized by taxpayers or not — in bringing about sustained economic development. The mountain of evidence that stadiums and teams don’t facilitate growth is clear, but lawmakers race to support them anyway. In light of this scholarship, the Michigan Legislature should cease to subsidize, directly or indirectly, the efforts of professional sports teams and their owners. The Legislature should act in light of this new study and kill or modify a proposal that has already passed through a state Senate committee and could help private developers finance construction projects — such as a new Major League Soccer stadium in Detroit. Most recently, a Michigan Senate committee approved legislation (SB 1061 and 1062) backed by businessman Dan Gilbert and designed to help public dollars finance private projects. Gilbert is the founder of Quicken Loans, among other companies, and has been acquiring properties in Detroit. He is interested in bringing a Major League Soccer team and new soccer stadium to Detroit. Those are part of a larger project, which he would pursue along with Detroit Pistons owner Tom Gore. The centerpiece of the $1 billion project would be a new soccer stadium, but it would be accompanied by offices, restaurants and hotel accommodations. The Senate legislation doesn’t mention sports stadiums or Dan Gilbert by name, but the proposed stadium project would appear to qualify for public support. Indeed, the bill contains some tailor-made attributes: It must be for a mixed-use project in a city with “a population of at least 600,000.” The project must also be worth at least $500 million. Whether the proposed legislation actually contributes to another Detroit stadium or some other project, it amounts to crony capitalism on steroids. The facts are that most empirical and anecdotal evidence, along with economic theory, suggests that these laws and related programs do little if anything to facilitate new economic development over time. It’s time for lawmakers to stop granting favors to sports stadium owners.